This item is made to order. Please allow 1-2 weeks. 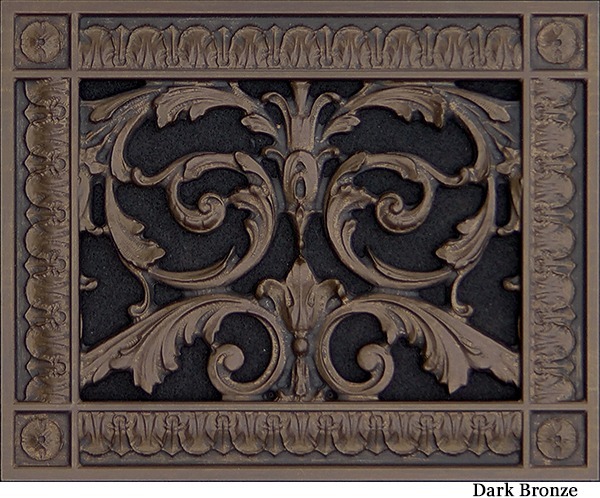 This Louis XIV style decorative grille can be used to cover a 6″ x 8″ heating and air conditioning duct as either a supply grille or a return air register. In addition it can be used as a speaker grille, foundation vent cover, return air filter grille or radiator cover. Beaux-Arts’ used historical ornamentation to create our Louis XIV decorative supply, return, speaker and filter grille collection. Our grilles are manufactured in the USA of the highest quality urethane resin which is strong, dimensionally stable and heat resistant and captures the exact details of the originals. Availability: This item is made to order. Please allow 1-2 weeks. Covers Duct Size: 6" x 10" Frame Size: 8" x 12" Thickness: 3/8"Frame Width: 1-5/16"
Availability: This item is made to order. Please allow 1-2 weeks. Covers Duct Size: 10" x 14" Frame Size: 12" x 16" Thickness: 3/8"Frame Width: 1-5/16"
Availability: This item is made to order. Please allow 1-2 weeks. Covers Duct Size: 4" x 14" Frame Size: 6" x 16" Thickness: 3/8"Frame Width: 1-5/16"
Availability: This item is made to order. Please allow 1-2 weeks. Covers Duct Size: 10" x 12" Frame Size: 12"x 14" Thickness: 3/8"Frame Width: 1-5/16"
Availability: This item is made to order. Please allow 1-2 weeks. Covers Duct Size: 4" x 12" Frame Size: 6" x 14" Thickness: 3/8"Frame Width: 1-5/16"
Availability: This item is made to order. Please allow 1-2 weeks. Covers Duct Size: 12" x 12" Frame Size: 14" x 14" Thickness: 3/8"Frame Width: 1-5/16"
Availability: This item is made to order. Please allow 1-2 weeks. Covers Duct Size: 14" x 24" Frame Size: 16" x 26" Thickness: 3/8"Frame Width: 1-5/16"
Availability: This item is made to order. Please allow 1-2 weeks. Covers Duct Size: 8" x 12" Frame Size: 10" x 14" Thickness: 3/8"Frame Width: 1-5/16"
Availability: This item is made to order. Please allow 1-2 weeks. Covers Duct Size: 6" x 6" Frame Size: 8" x 8" Thickness: .375"Frame Width: 1-5/16"
Availability: This item is made to order. Please allow 1-2 weeks. Covers Duct Size: 6" x 8" Frame Size: 8" 10" Thickness: 3/8"Frame Width: 1-5/16"
Availability: This item is made to order. Please allow 1-2 weeks. Covers Duct Size: 8" x 14" Frame Size: 10" x 16" Thickness: 3/8"Frame Width: 1-5/16"
Availability: This item is made to order. Please allow 1-2 weeks. Covers Duct Size: 6" x 36" Frame Size: 8" x 38" Thickness: 3/8"Frame Width: 1-5/16"
Availability: This item is made to order. Please allow 1-2 weeks. Covers Duct Size: 12" x 16" Frame Size: 14" x 18" Thickness: 3/8"Frame Width: 1-5/16"
Availability: This item is made to order. Please allow 1-2 weeks. Covers Duct Size: 6" x 30" Frame Size: 8" x 32" Thickness: 3/8"Frame Width: 1-5/16"
Availability: This item is made to order. Please allow 1-2 weeks. Covers Duct Size: 14" x 14" Frame Size: 16" x 16" Thickness: 3/8"Frame Width: 1-5/16"